'American Gods Vol. 1: Shadows' brings Neil Gaiman's world to life in a beautiful way – AiPT! American Gods brings together enough artistic talent to bring to life a variety of world myths. It’s been about 15 years since Neil Gaiman’s novel, American Gods, was first published, and it’s hotter than ever these days. Not only is there a television series on Starz, which aired its first season last year and is gearing up for a second, but Dark Horse is publishing the comic book adaptation. Between a full length novel and a live action TV series, can a combination of words and art bring something new to the story? American Gods is the story of Shadow Moon, the newly released from prison ex-convict who discovers that he’s also newly widowed and without a job to return to. He meets the enigmatic Mr. Wednesday, whose job offer puts Shadow on the front lines of a war between the ancient gods brought to America and the technologically advanced new gods that have sprung up in the good old US of A. Wednesday brings Shadow along on a quest because he knows this country isn’t big enough for both groups of gods. 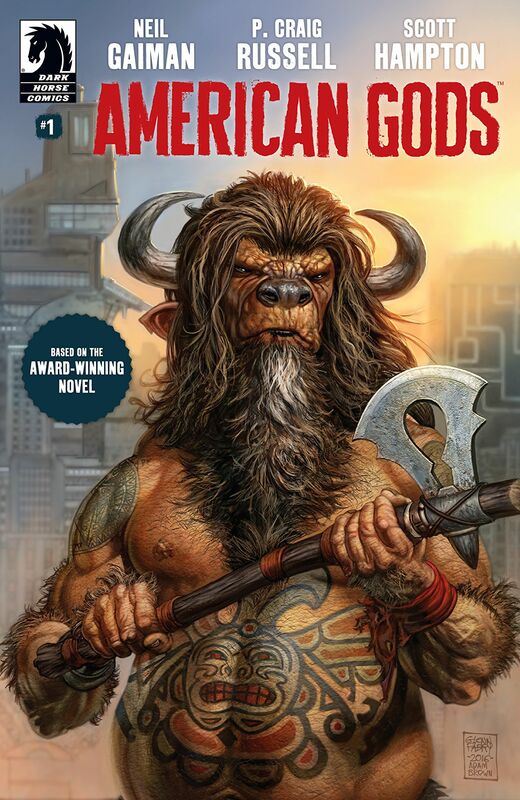 The American Gods Shadows hardcover collects the first nine issues of the comic book series, which corresponds to the first eight chapters of Gaiman’s novel (which is also collectively called “Part One – Shadows” in the book). Scripted by P. Craig Russell, the comic book series is very faithful to Gaiman’s novel (unlike the TV series, which adds scenes and rearranges plot points here and there), not shying away from any of the more adult bits. Russell sticks so close to the book that he uses direct quotes in many captions, which ends up being one of the few drawbacks. Sure, Gaiman has a way with words, but a good comic book knows when to go light on the words and let the visuals do the talking. Shadow is a very self-reflective character who initially just wants to keep his head down, and thus, he’s not very outwardly expressive. It falls on the shoulders of artist Scott Hampton to convey his mood, and it ends up being a mixed bag of hits and misses. Some of Shadow’s expressions come across as dull or bored when inside he’s hurt or confused. That isn’t to say Hampton’s art is a letdown, though — his character designs are on point in ways the live action series can’t be. Orlando Jones turns in a powerful performance as Mr. Nancy, but he doesn’t look like the character Gaiman constructed. Hampton manages to perfectly portray Shadow’s racial diversity, the antique computer monitor-like effect of Technical Boy, the twisted look of Laura’s animated corpse, and many of the other characters. American Gods is, in many ways, a road trip through America, and again, Hampton delivers when it comes to the open road, the big city, and the wilderness. And then there are Shadow’s freaky dreams along with chapters five and six, which are downright surreal, and the art does them justice. In Gaiman’s original novel, he there are a handful of asides called “Coming to America” (and one called “Somewhere in America”) which tell the stories of immigrants bringing the more supernatural aspects of their culture to the US. The comic adaptation includes all these as well, bringing in a different creative team for each. The likes of Lovern Kindzierski, Walter Simonson and Laura Martin, Colleen Doran, and Glenn Fabry and Adam Brown lend their talents to tackle myths from around the world. Fabry is also responsible for the bold and striking covers of each chapter. These are paired with the more mystical, surreal chapter design pages by David Mack. The story itself is engaging, but in terms of pacing, it’s better suited to be read in its original novel form, whose chapters can be of any length. The individual comic book issues are 30 or so pages long, and thus, chapters have to be restricted by those page lengths. Not every issue features a “Coming to America” segment, and some issues may feel more even or more complete than others, and story progression suffers for it. Fortunately, you don’t notice it as much reading from a collected edition. Another advantage of the hardcover are the bonuses. It includes a sketchbook of Hampton’s character designs with notes from editor Daniel Chabon, cover sketches from Fabry, and layouts and pencils from select scenes from the “Coming to America” segments. A faithful adaptation of the original novel that, while not always satisfying on the art when it comes to characters, manages to bring the world to life in a beautiful way.